The major nuclear powers convened in Beijing for a two-day conference on Wednesday. There are calls from China to preserve the nuclear non-proliferation treaty (NPT) and maintain international stability. What is the United Nations NPT? It is an important international treaty to prevent the spread of nuclear weapons and weapons technology. It aims to eventually achieve nuclear total disarmament and promote the peaceful use of nuclear energy. It came into force in 1970 and was extended in 1995.
Who signed the NPT and who didn't? A total of 191 countries signed up for the treaty, including the five nuclear states. India, Pakistan, and North Korea are not part of the treaty but have nuclear weapons at the moment. North Korea withdrew from the treaty in 2003.
Who are at the two-day conference? China, Russia, US, UK, and France - the five major nuclear nations. Why is this conference happening? 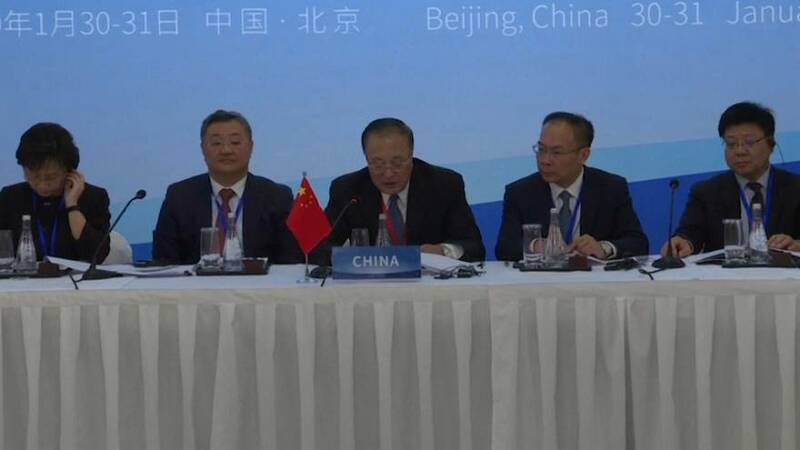 This two-day conference in Beijing is the third part of the preparatory process for the 2020 Review Conference. Every five years, there are three preparatory meetings to look at making changes and adapting to what's happening globally. Which nations have nuclear weapons? Russia, China, United States, France, and the United Kingdom who are part of the NPT treaty. India, Pakistan, and North Korea also have nuclear weapons but not part of the treaty as mentioned above. Israel is widely believed to possess warheads but information surrounding such capability is not in the public domain. They are however very vocal in their opposition to the 2015 Iranian nuclear deal. The Chinese Assistant Foreign Minister Zhang Jun, in his opening speech during a conference in Beijing on Wednesday, called on the five major nuclear nations, the US, Russia, China, the UK, and France, to all support the current NPT regime to maintain international stability. Zhang Jun, Chinese Assistant Foreign Minister said, "We should listen attentively to the voice and appeal of the international community, and increase our mutual understanding so as to find a practical routine for nuclear disarmament. We should illustrate our political will of preserving the NPT (Nuclear Nonproliferation Treaty) regime so as to stabilise the positive expectations of the international community." At the conference, China's Foreign Ministry spokesman Geng Shuang, said all five countries are willing to work together. "The five nuclear nations of China, France, Russia, the United Kingdom, and the United States all affirmed that they have an important and special responsibility to safeguard international peace, security, and stability, and realised that the current international security environment faces severe challenges. They are willing to strengthen coordination, manage differences and cope with international security challenges together," said Geng. What does the United States say? But the US Under Secretary for Arms Control and International Security, Andrea Thompson, criticised China and Russia for a lack of transparency in their reports on their arms control and non-proliferation obligations. "We previously agreed a set format for reporting (on non-proliferation obligations), but the gap between the reports of the United States on the one hand, and Russia and China on the other, is great. In this respect, the criticism from others is warranted," Thompson said. What does the United Kingdom say? Meanwhile, the British representative Philip Barton said the NPT had been key in preventing Iran and North Korea’s nuclear ambitions. Barton, Director General of Consular and Security at the UK Foreign and Commonwealth Office said, "The treaty has also been the bedrock of our efforts to achieve our shared goals of preventing Iran from acquiring nuclear weapons and persuading DPRK (Democratic People's Republic of Korea/North Korea) to relinquish its weapons of mass destruction and ballistic missiles in a complete, verifiable and irreversible manner. These two dossiers continue to be very much at the top of the UK's priorities, as we look at the world today and how we can improve our collective security."